Using multi-levels in design makes a dynamic statement, but multi-leveled bathroom design is making a powerful design impact. 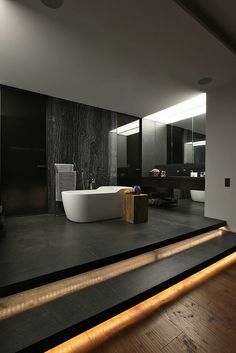 Here are a few examples of bathroom design featuring multi-levels and stair to break up the floor plan and additional style in height. Dark flooring with contrasting highlights in the steps break up this mostly dark master bath. Different tones in natural woods give textures to this simple multi-leveled bathroom design. Walls as works of art.